Title: The Power and the Prize! Synopsis: Fantasy Masterpieces #3 reprints Silver Surfer #3 (December 1968). The issue starts at a hospital where the Silver Surfer is trying to use his powers to heal a little girl who was injured last issue. He is driven away by the frightened hospital staff and the police who fire their weapons at him in close quarters. Frustrated and angry at the mistrust and foolish behavior of humanity, the Silver Surfer uses his cosmic powers to shut down communications and power worldwide, bringing civilization to a standstill. The evil being Mephisto senses this disturbance on Earth and decides to seek out and engage the Sentinel of the Spaceways. Mephisto is able to bring the Surfer's love Shalla Bal to Earth to serve as a pawn in his scheme. 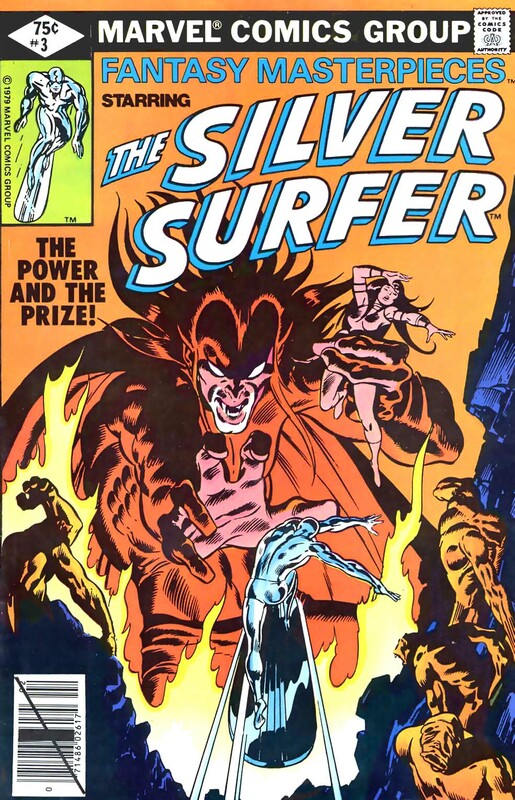 Mephisto and the Surfer battle as the Lord of the Lower Depths realizes that the hero's inherent goodness and desire to better humanity is a threat to the primal forces on which he thrives. When force fails to win the day, Mephisto tries bribery and compassion to win the Surfer to his side. Ultimately he makes the hero choose between serving his evil agenda or losing Shalla Bal who Mephisto threatens to return to Zenn-La. The Surfer makes the difficult choice and Shalla Bal is returned home. This classic conflict is also reprinted in the classic Fireside volume Bring on the Bad Guys.